Back cover blurb: Swinging in the Sun, Twisting Under the Moon, Surfing Up a Storm. The whole gang is back on Muscle Beach having the BALL of a lifetime. Quick flick reveals: No sooner did I start this blog, but the Great Unnameable from which I source the books closed for Christmas, depriving me of the pulpy goodness that flows from its teat. Consequently, this week I am presenting a book from my collection which I have written about before somewhere else (You know the London Review of Books? Not there). 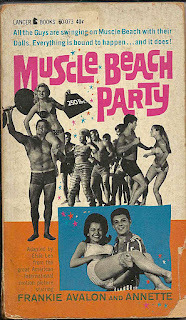 Muscle Beach Party was a film in the Beach Party series of the 60s starring Frankie Avalon and Annette Funicello. It is a knockabout comedy, mostly built around sight-gags and musical numbers. The fact that a novelisation was commissioned is, therefore, slightly odd, reminiscent of the Woody Allen short story about the serious writer who takes a job adapting a Three Stooges film into a book. Nevertheless, Lee gamely strives to make the material work, and the end result is actually more entertaining than you might expect: i.e., moderately. In a move that defies all known laws of sensible business practice, this book was republished in 1988.